Knowing how to graph trig functions allows you to measure the movement of objects that move back and forth or up and down in a regular interval, such as pendulums. Sine functions are perfect ways of expressing this type of movement, because their graphs are repetitive and they oscillate (like a wave). Because the graph of the sine function is being graphed on the x–y plane, you rewrite this as f(x) = sin x where x is the measure of the angle in radians. into the sine function. Because the radius of the unit circle is 1, the y values can’t be more than 1 or less than negative 1 — your range for the sine function. So in the x-direction, the wave (or sinusoid, in math language) goes on forever, and in the y-direction, the sinusoid oscillates only between –1 and 1, including these values. In interval notation, you write this as [–1, 1]. To complete this step, use your knowledge of the range from Step 1. You know that the highest value that sin x can be is 1. At what angles(s) does this happen? It repeats itself every 2–pi radians. This repetition occurs because 2-pi radians is one trip around the unit circle — called the period of the sine graph — and after that, you start to go around again. 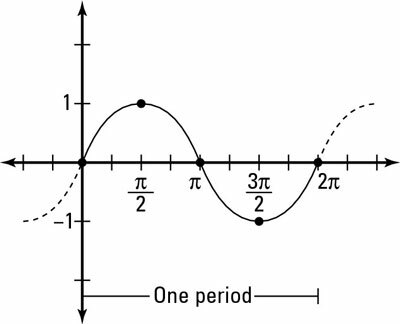 Usually, you’re asked to draw the graph to show one period of the function, because in this period you capture all possible values for sine before it starts repeating over and over again. The graph of sine is called periodic because of this repeating pattern.